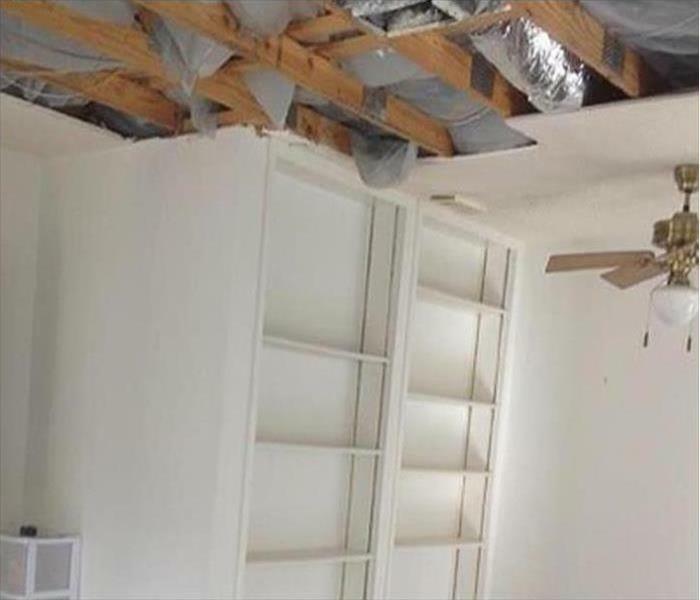 The billowing polypropylene sheeting has been taped to the floor and walls in this Preston Hollow home to quickly extract the remaining moisture in the "tented" areas. 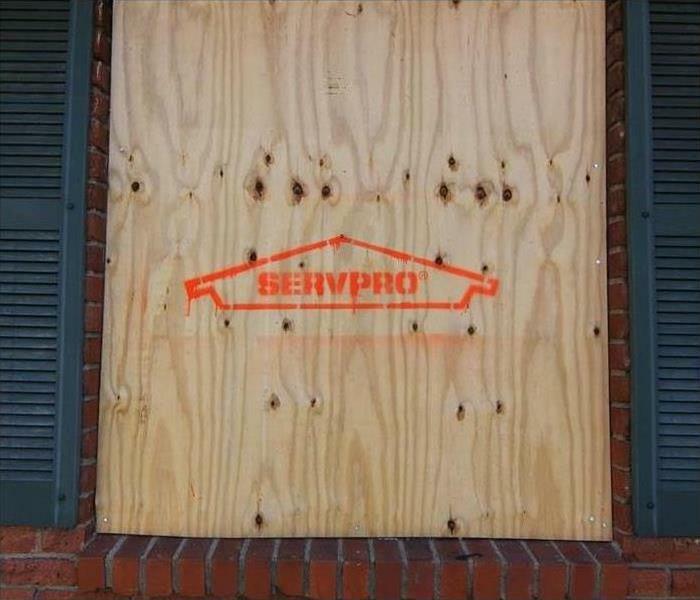 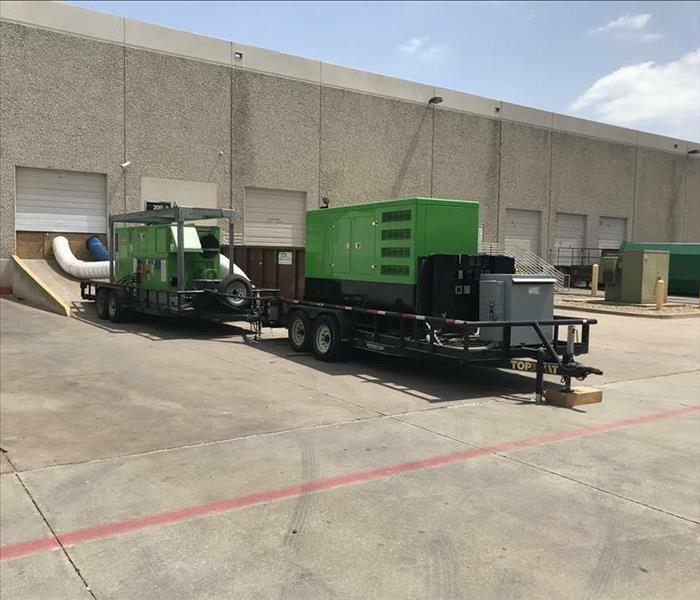 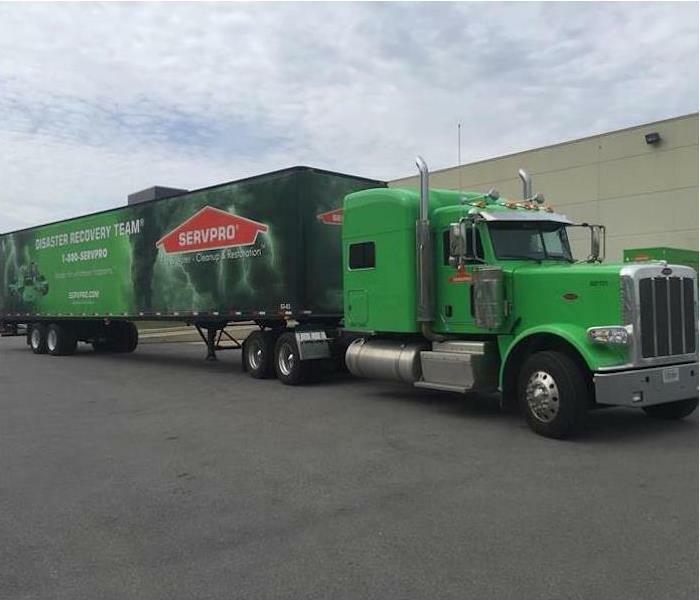 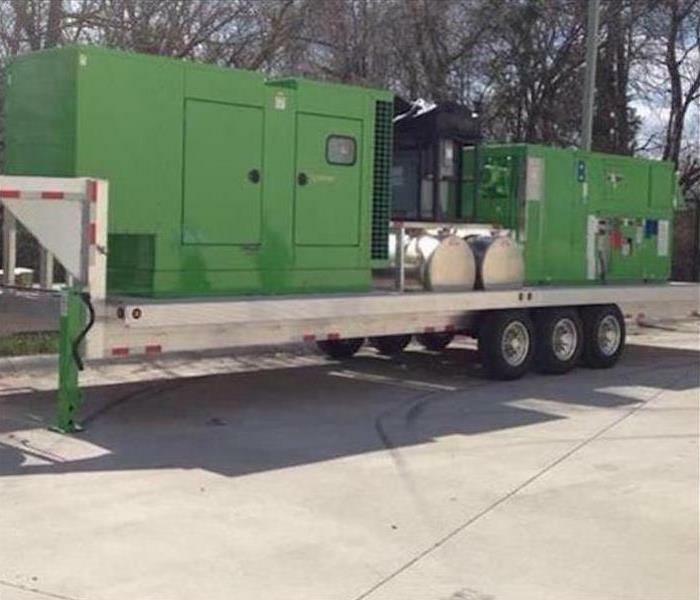 SERVPRO crews are well-versed in rigging our equipment to minimize water damage to our customers' properties, both residential and commercial. 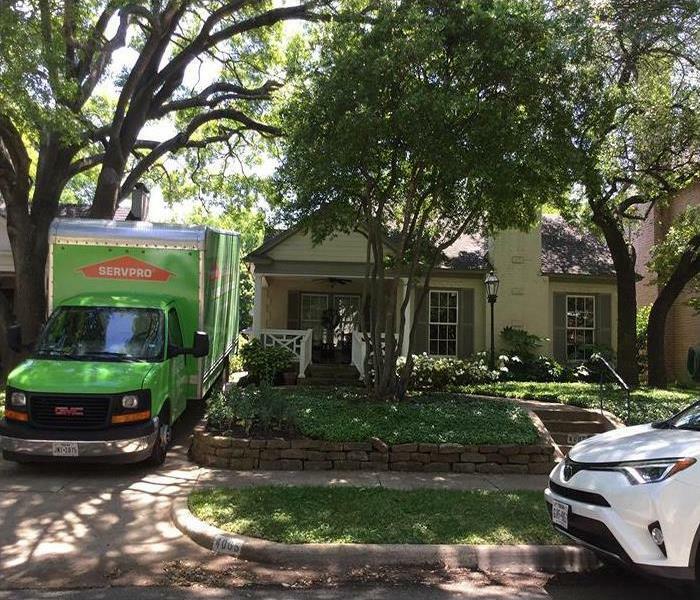 After water is extracted from a leak causing intrusion into a carpet in Preston Hollow, what is next? 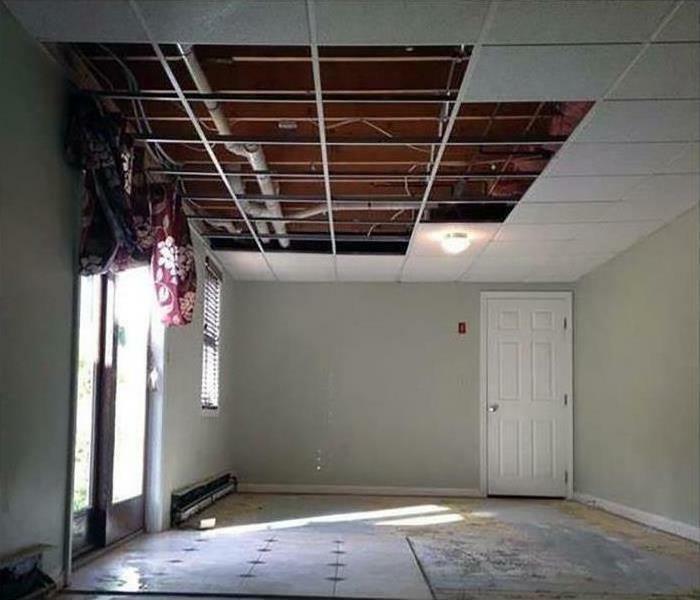 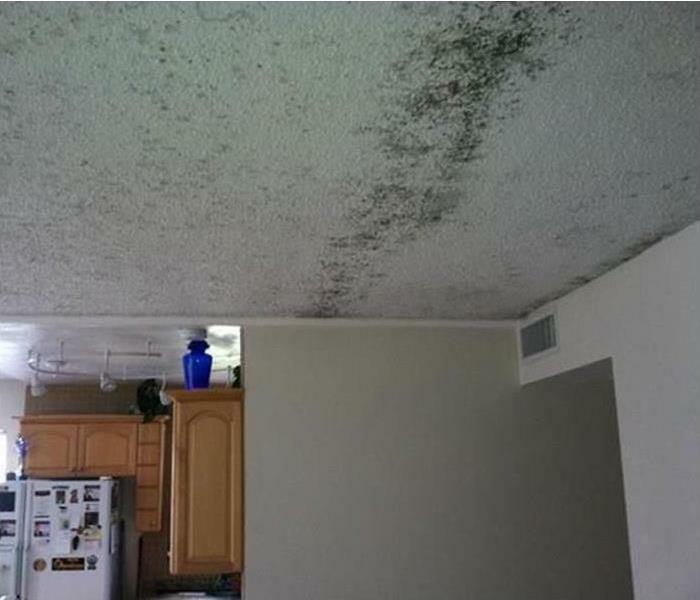 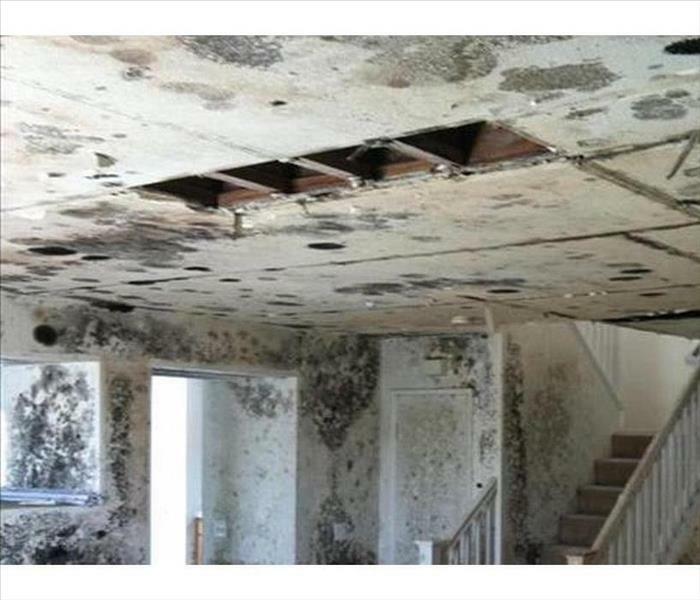 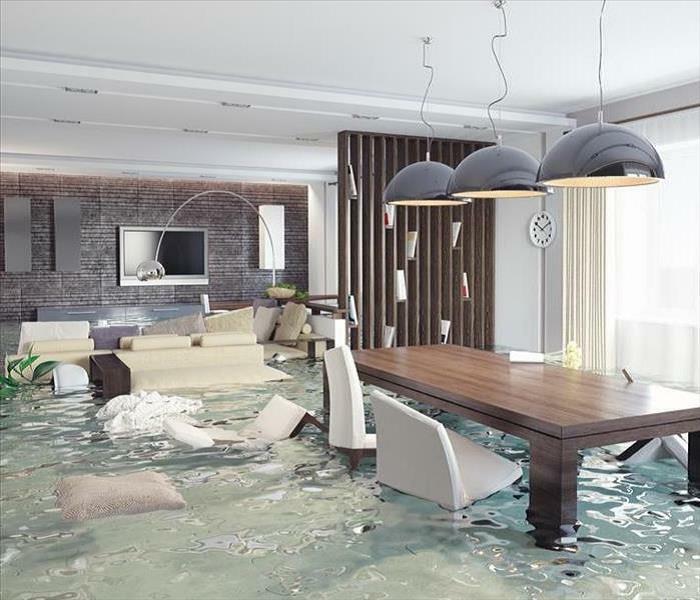 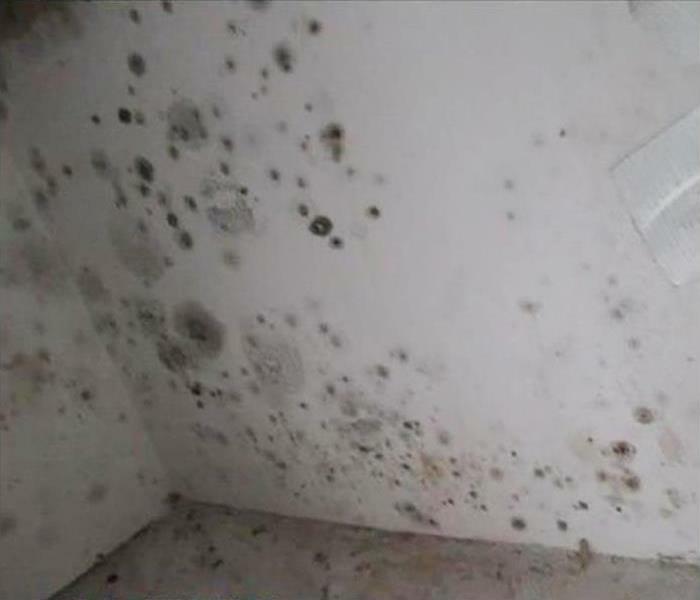 Removal of the moisture and humidity that can continue to cause secondary water damage. 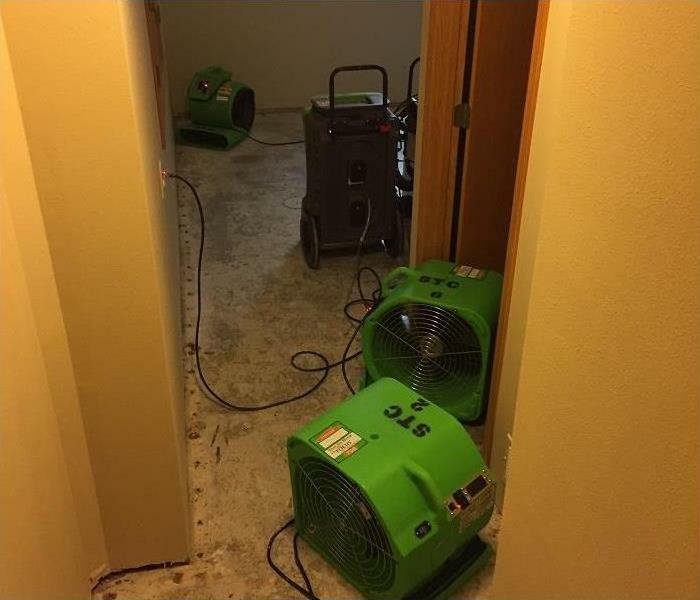 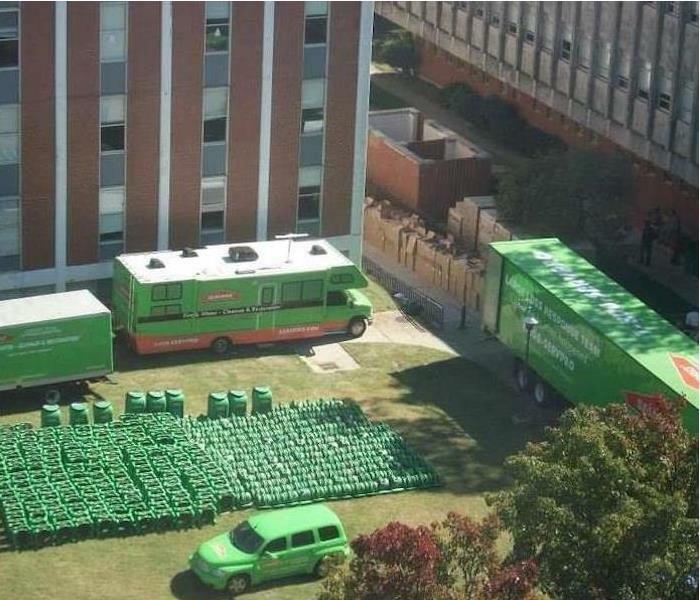 The LGR dehumidifiers and air movers, part of the SERVPRO inventory professionally resolve lingering issue. 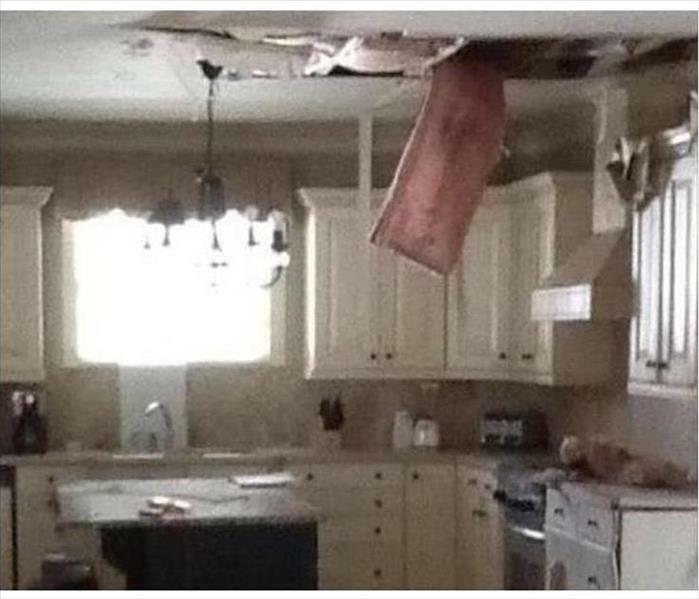 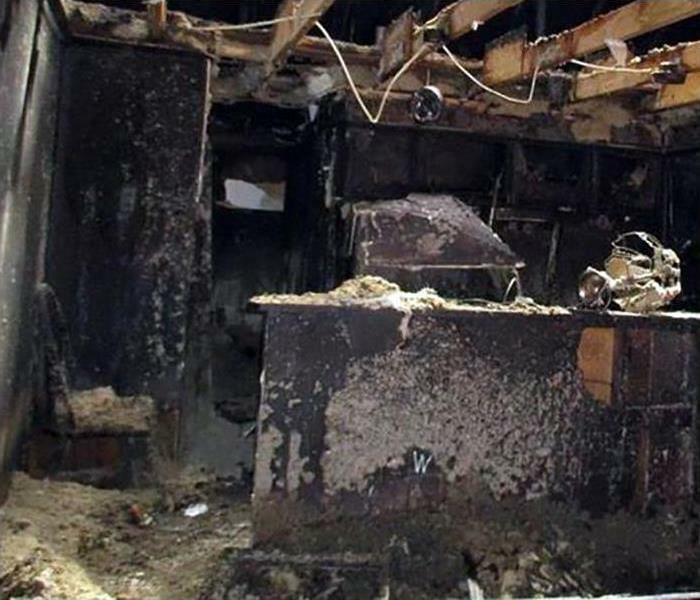 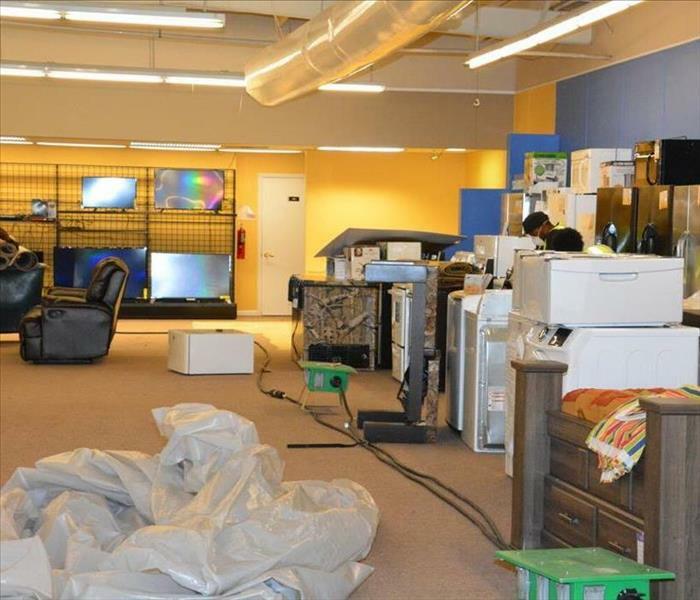 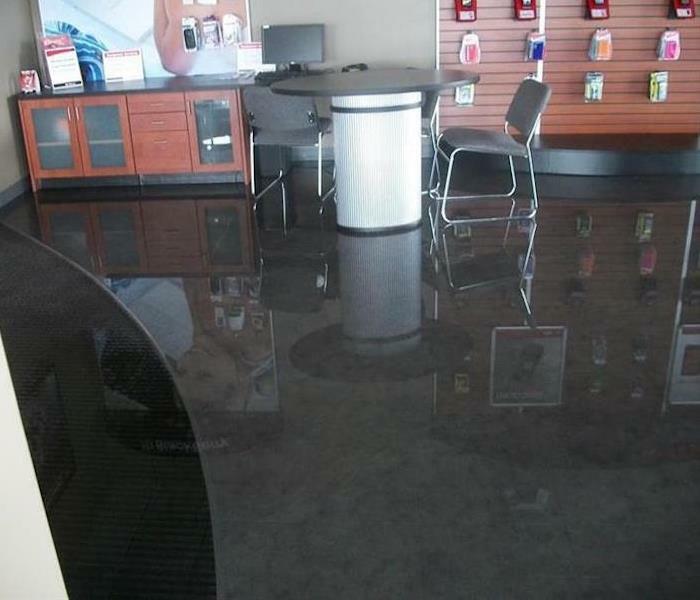 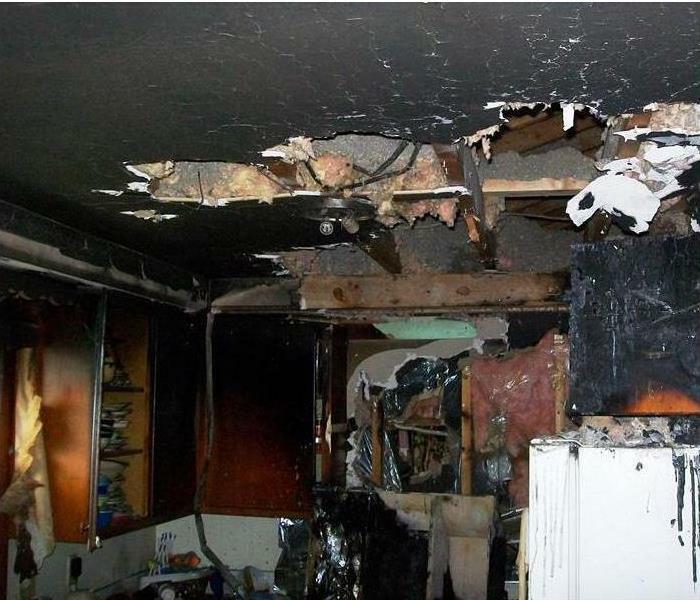 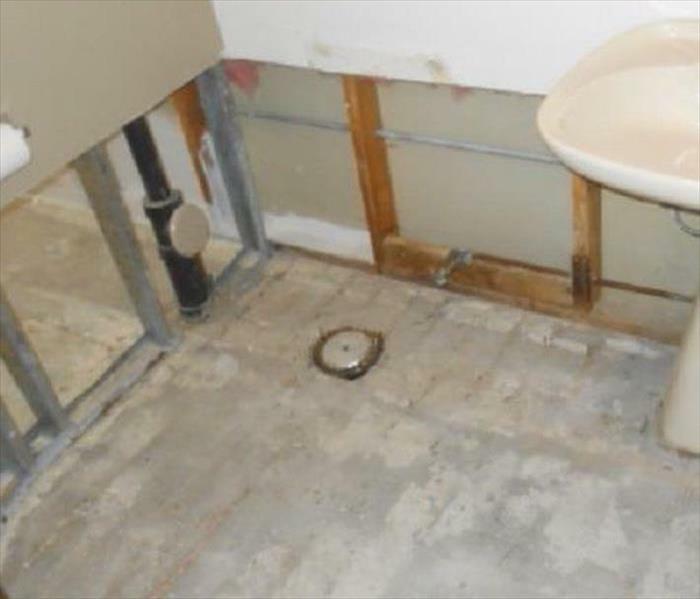 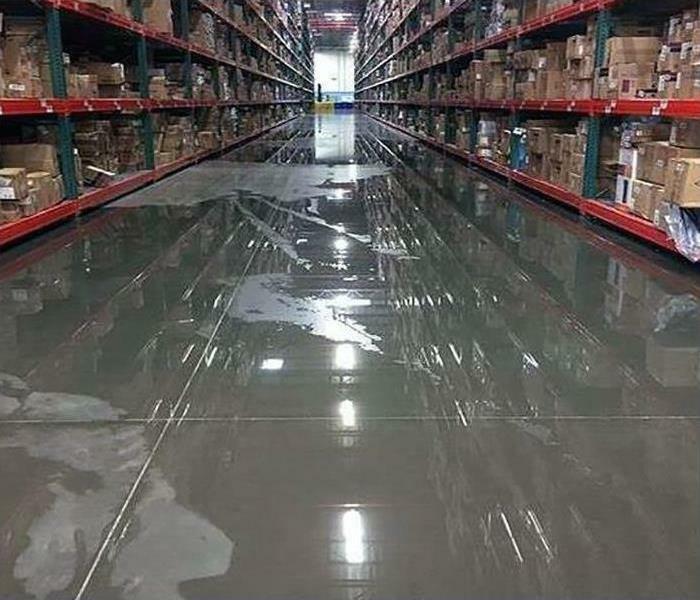 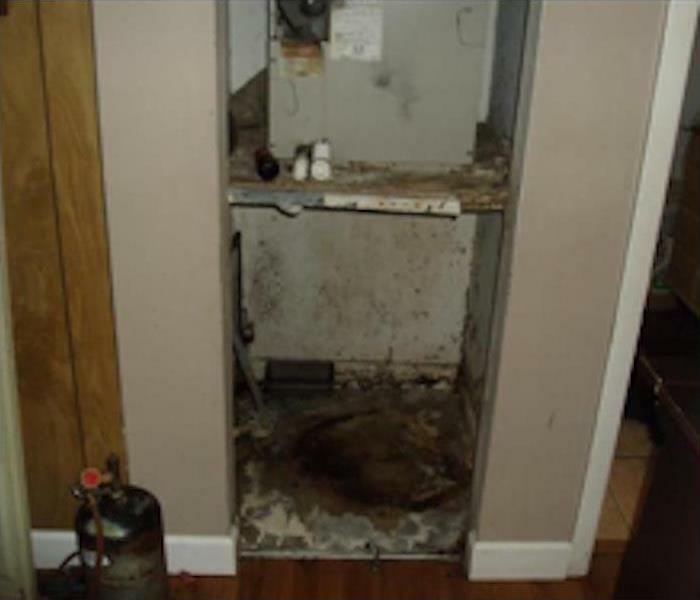 Water damage at this Dallas commercial facility was the result of a burst water supply line. 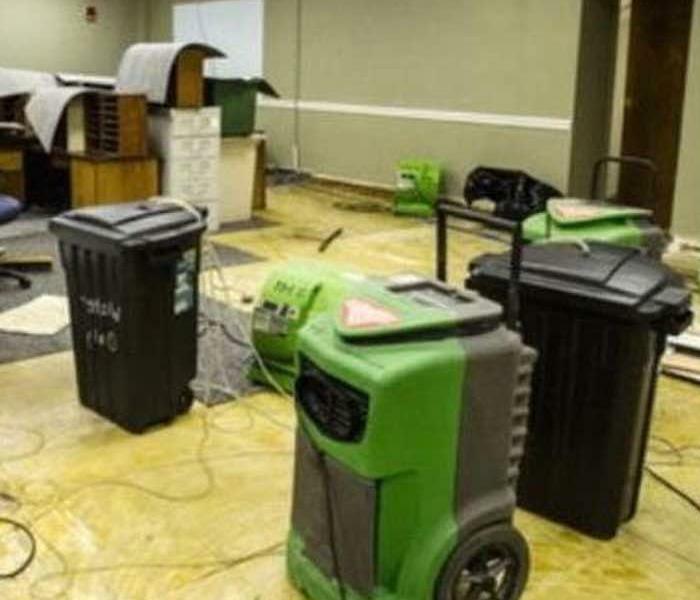 Twenty-five thousand square feet of commercial office space were water damaged from this event. 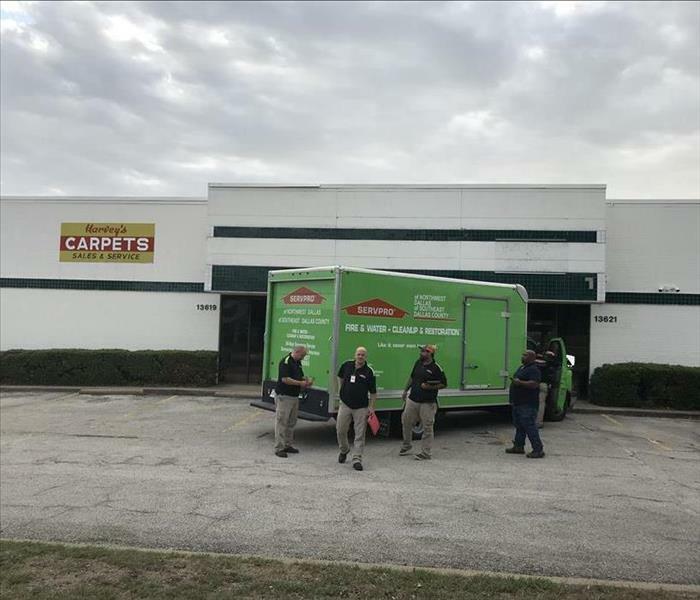 SERVPRO had the amount of equipment necessary to cope with the scope of this project. 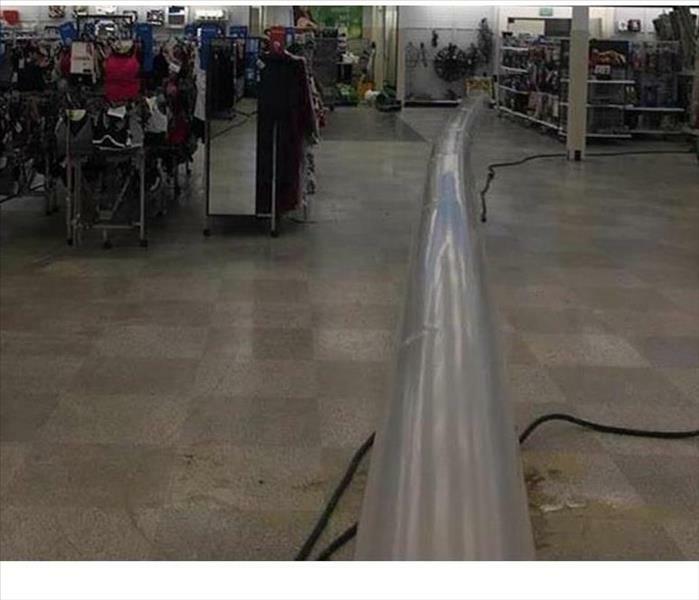 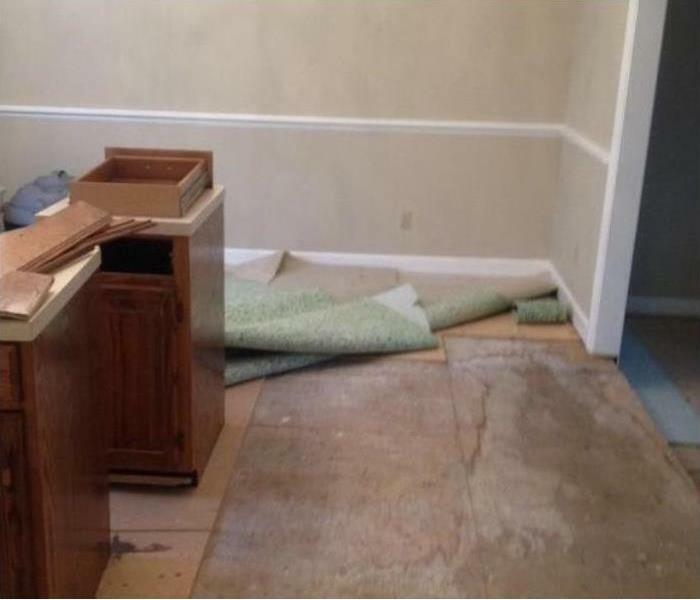 The leak from the toilet supply line was large enough to drench the walls and linoleum flooring forcing us to toss those items and start anew. 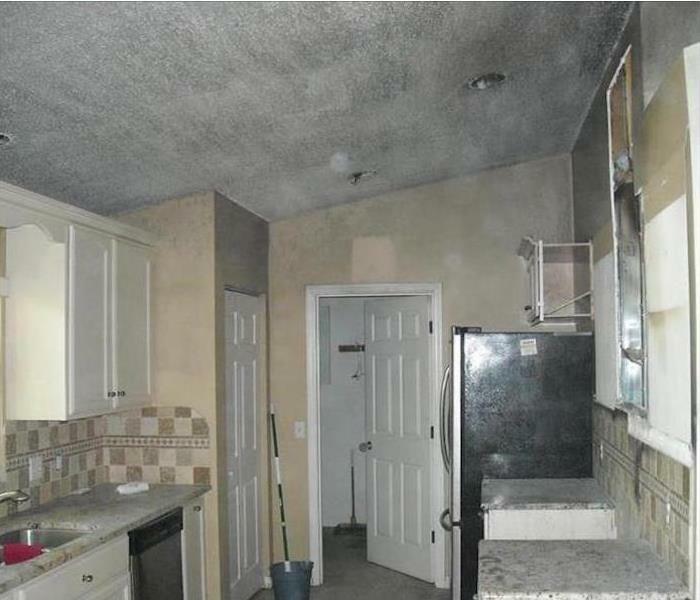 We dried out the area, sprayed an anti-fungal and disinfected the surrounding space before the rebuild. 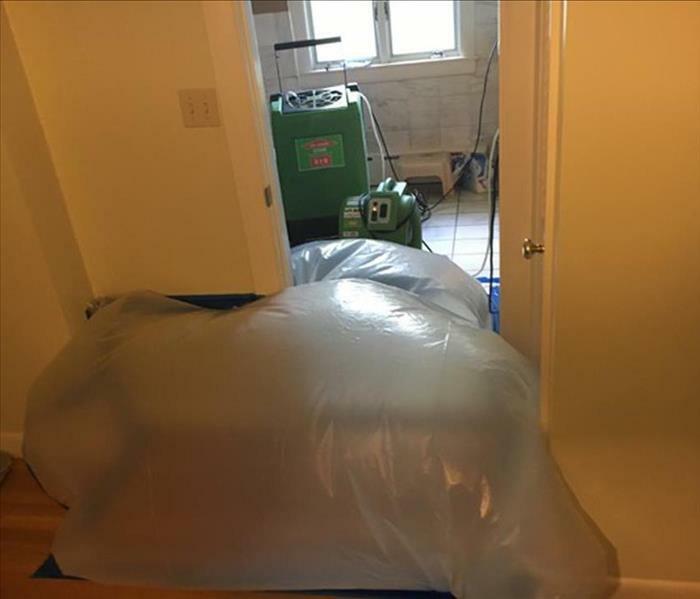 Water damage to this Dallas condominium thoroughly saturated the carpeting. 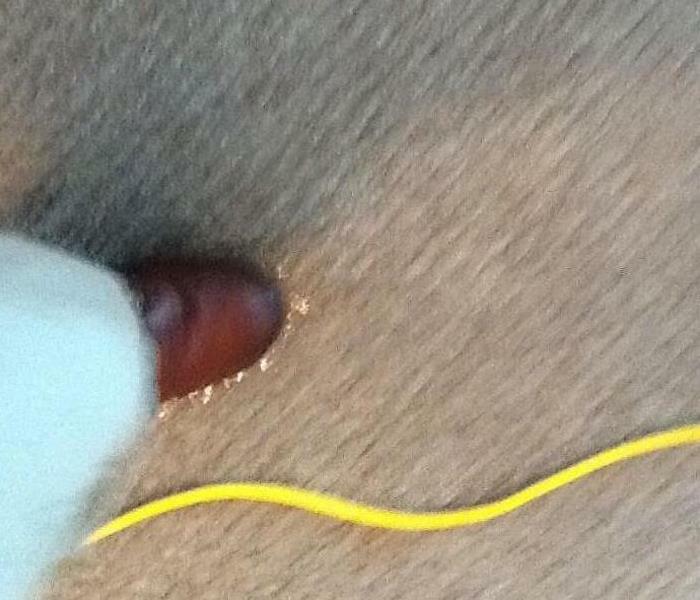 The photo shows water surfacing on the carpeting as the SERVPRO technician places his weight on the floor. 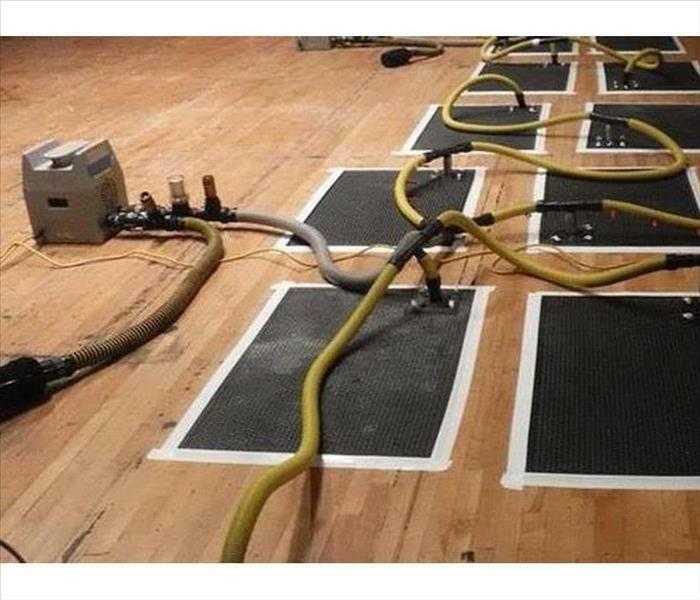 We were able to extract the water from the carpeting in time to prevent any permanent damage to the subflooring. 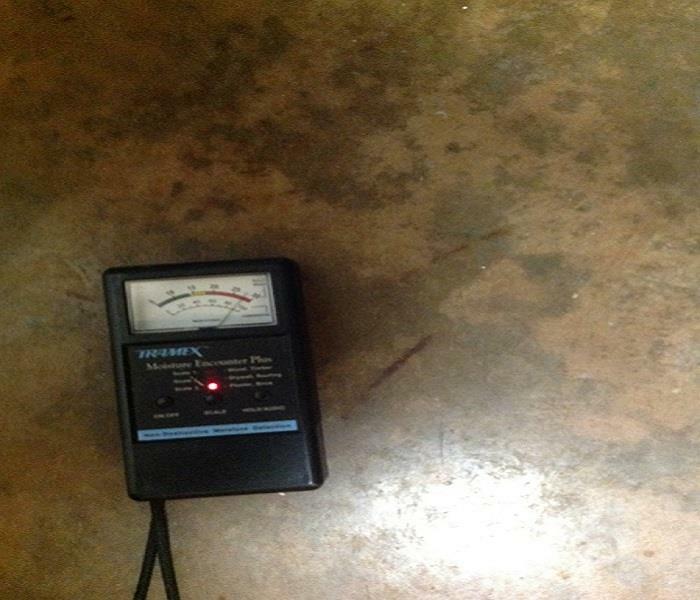 This is an advanced moisture measurement tool. 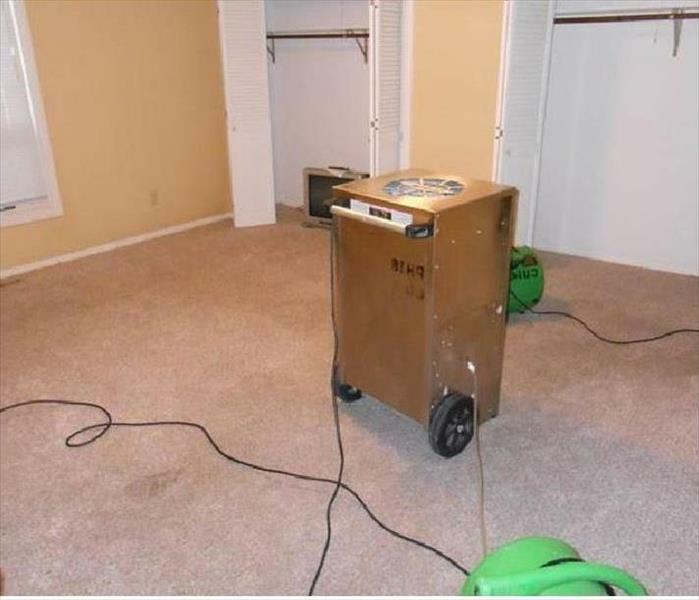 While it may seem that all the moisture is gone, this instrument can detect Dallas water damage not visible to the naked eye. 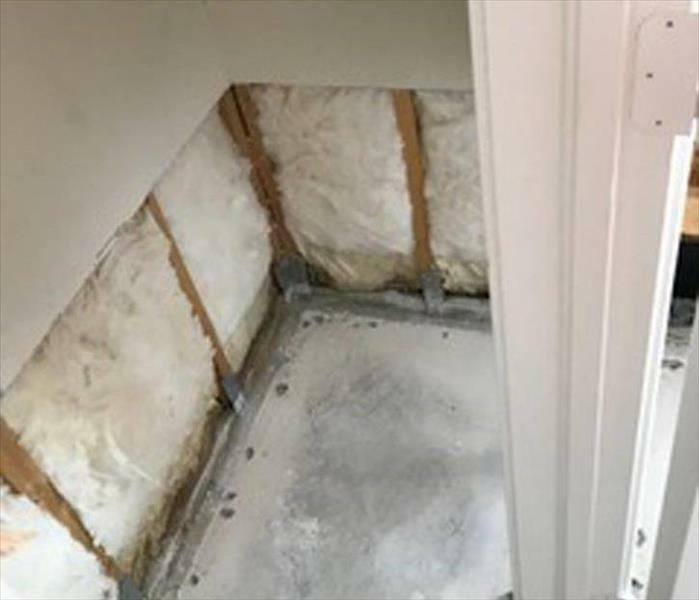 The tool is able to locate moisture in many materials like wood, drywall, plaster, brick, block, roofing and most of the materials used in creating the building envelope. 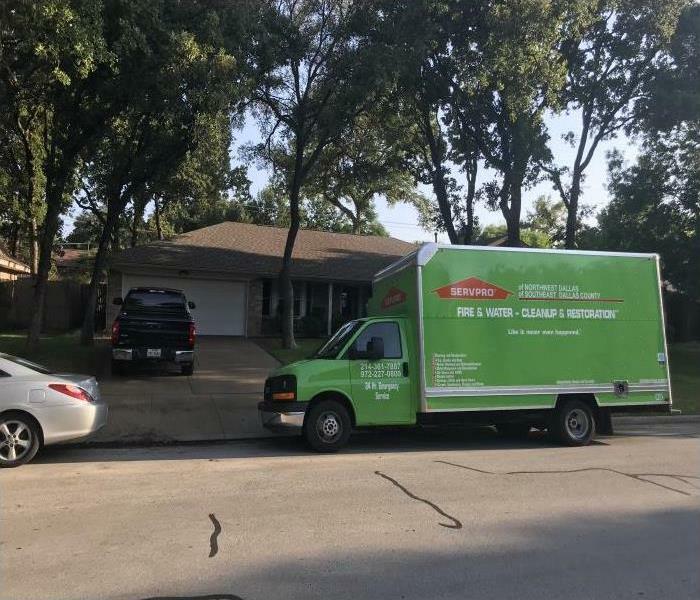 SERVPRO of Northwest Dallas utilizes this advanced tool and others to deliver the finest service in the industry. 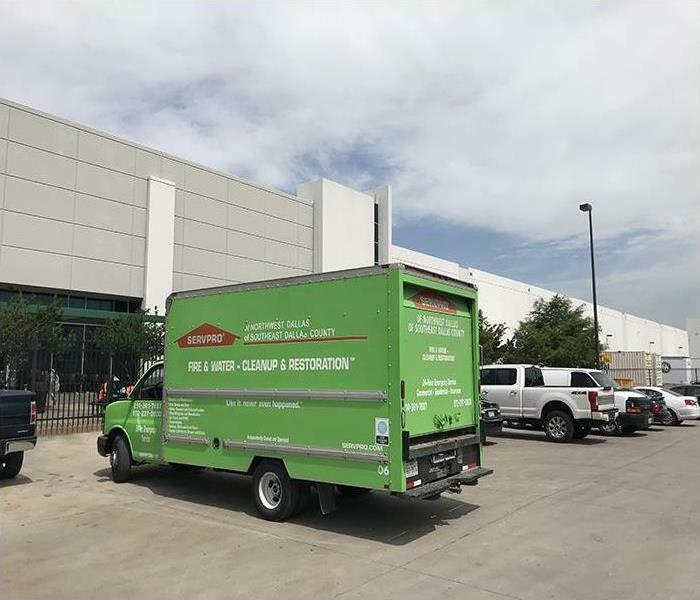 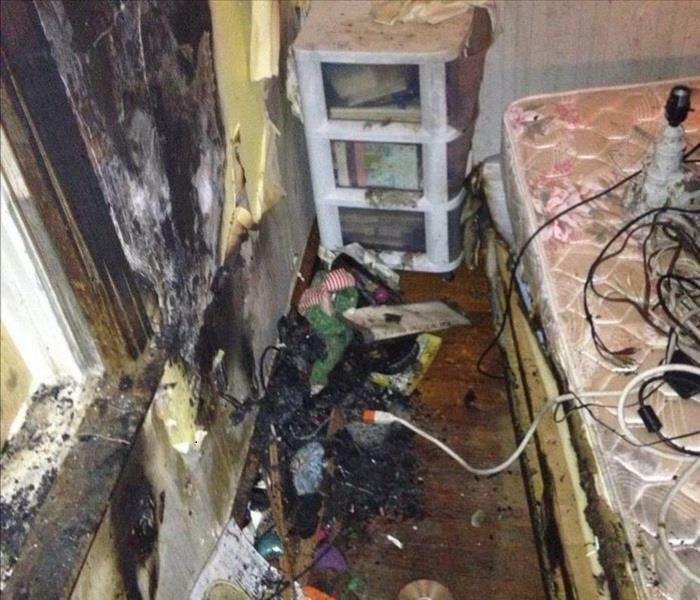 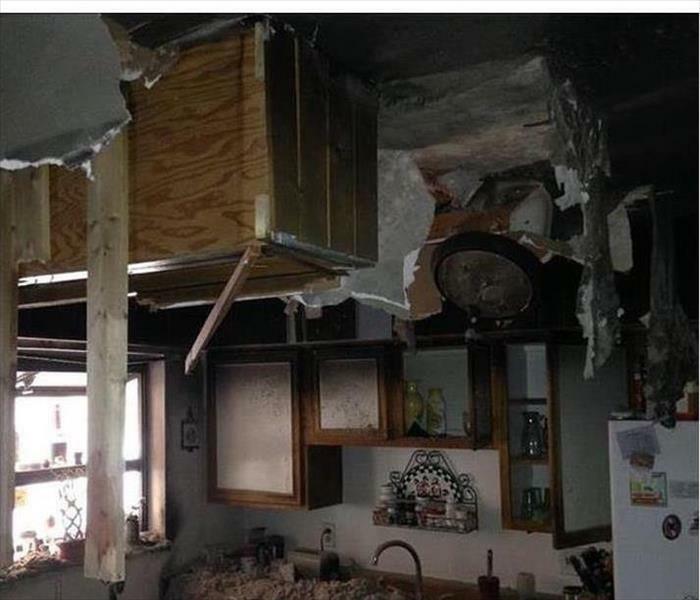 Our technicians are trained and certified to handle Dallas fire and water damage restoration, SERVPRO cleanup, water & fire damage, Cedar Hill smoke damage, Lancaster fire restoration, Balch Springs smoke damage, Dallas fire damage, Wills Point soot removal, kitchen fires, clean up smoke damage, fire restoration companies, cleaning smoke damage, cleanup, and fire extinguisher cleanup. 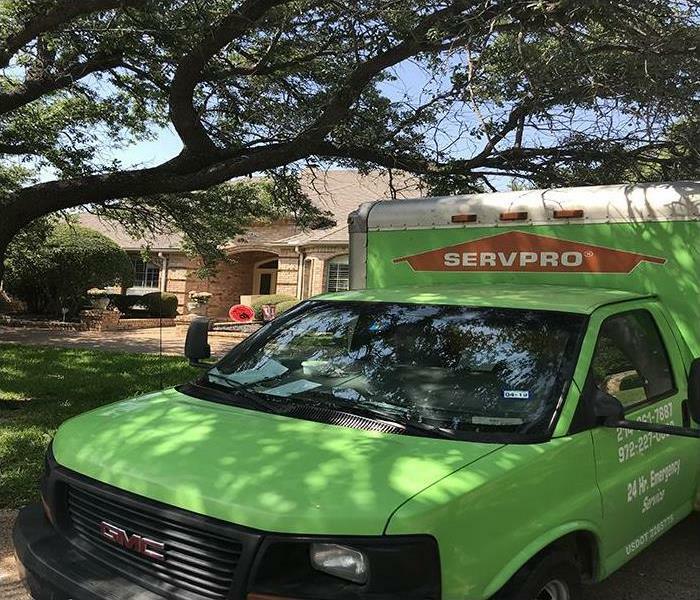 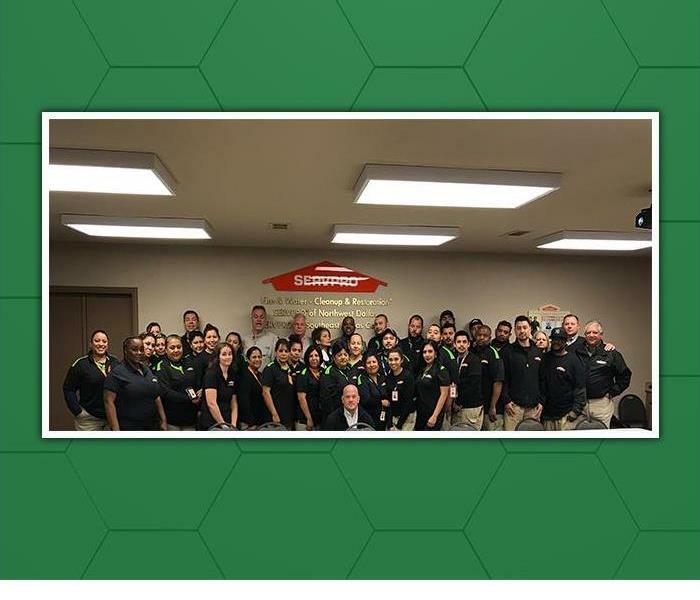 SERVPRO of Northwest Dallas is ready to help 24/7. 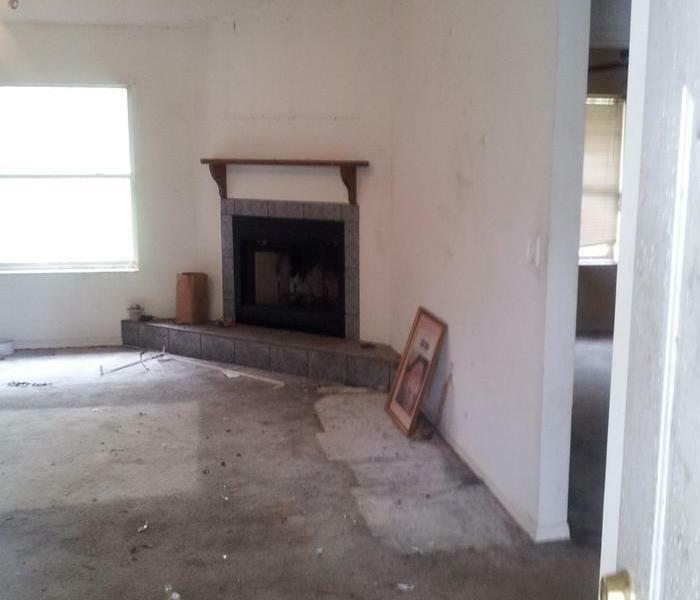 Please call (214)361-7887.